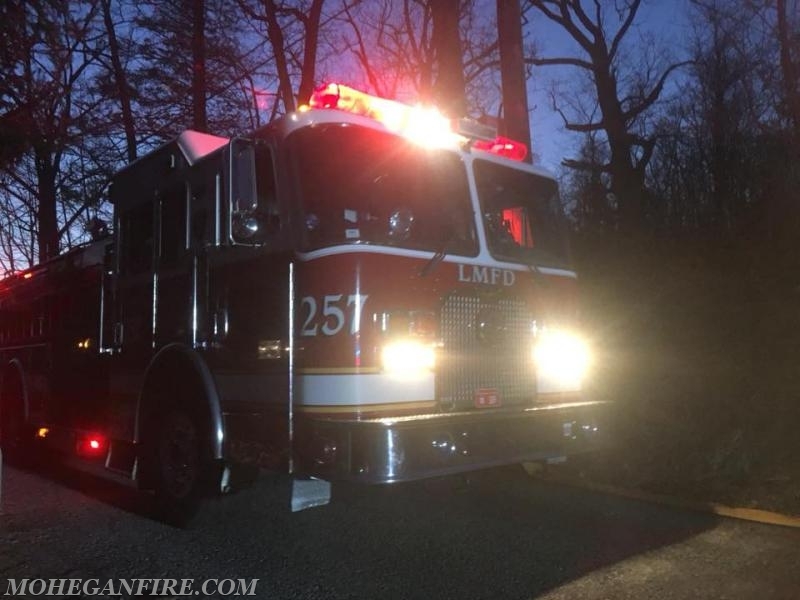 At 6:20pm tonight Sunday 4/22/18, Mohegan FD was dispatched to Scofield Rd in Mohegan Lake for a reported structure fire. Upon arrival, units found a heavily involved structure fire. Heavy fire was visible from the entire front of the residence including the front door and 2nd floor front window. 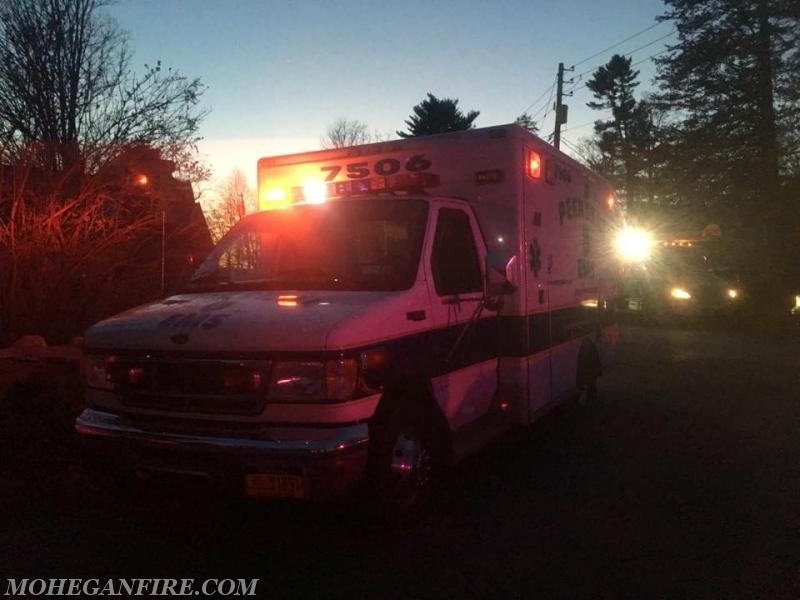 The 10-75 was transmitted adding Yorktown FD's FAS-Team, Putnam Valley FD's Rescue for its cascade, Mohegan EMS, Peekskill EMS Rehab. Two 1 3/4" hoses were stretched from Ladder 35, while Engine 257 laid a 5" supply hoseline from a hydrant into the scene. Firefighters aggressively attacked the fire from the interior and the fire was knocked down. Members also ventilated to roof. In the early stages of arrival on scene, the residence electrical service line from the utility pole burned off and began arcing on the street and front lawn. 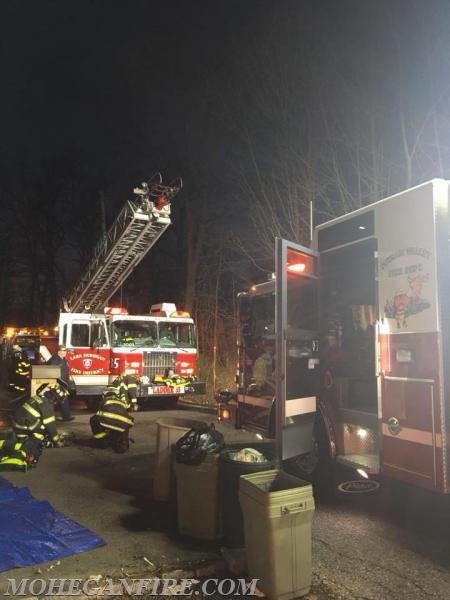 Con Edison Electric was also requested to the scene with a rush, as members operating on scene were in jeopardy of being harmed and one hoseline became damaged from the sparks of the arcing electric wire on top of it. The electric was eventually shut off upon Con Edison Electric's arrival with no further damage. Firefighters, during secondary searches, located and removed one of the resident's cats alive and meowing. 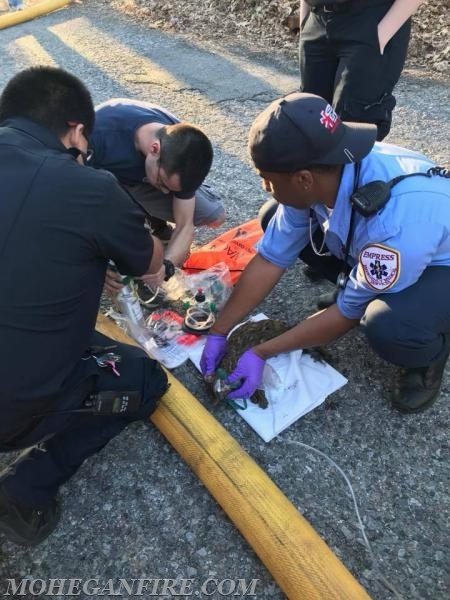 With the help of Mohegan EMS and Peekskill EMS using a pet oxygen mask, the cat was treated and brought to a local 24 hour veterinary hospital by Mohegan EMS 6911 for further treatment. Once the fire was under control, one member suffered a minor injury and was transported to Hudson Valley Hospital by 69B1. Yorktown Volunteer Ambulance Corps was then requested to the scene and stood by due to additional EMS calls in district. Also assisting on scene were Westchester County Dept of Emergency Services Battalion 17 and Cause and Origin Team, Putnam County Bureau Yorktown Police Department, Yorktown Building Dept, Con Edison Electric, and the American Red Cross. 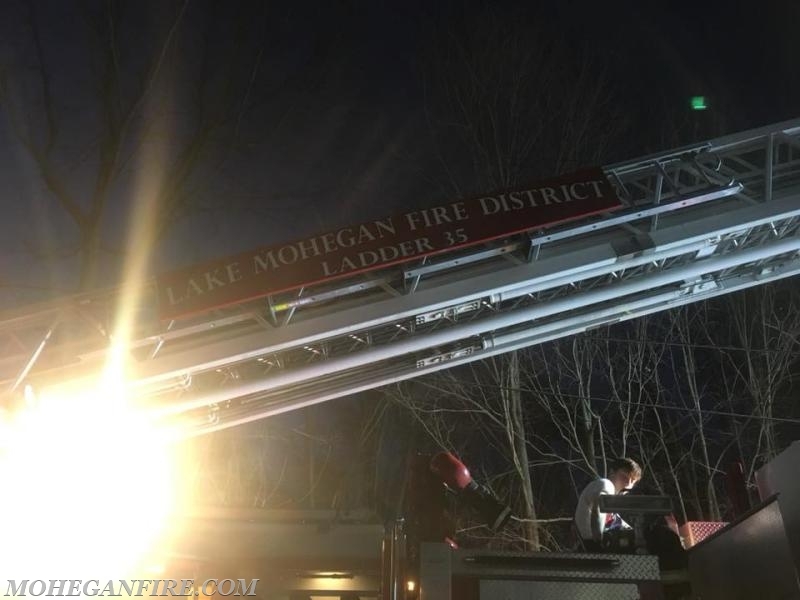 Peekskill FD Engine 132 and Mahopac FD Tower Ladder 18-5-1 relocated and covered Mohegan FD for additional calls, and Peekskill FD Engine 132 responded to a residential alarm on Holyoke Dr. All Mohegan FD units cleared the scene by 9:45pm. The fire was deemed accidental and possibly electrical. All photos are courtesy of FF Gus Stretz unless otherwise noted. 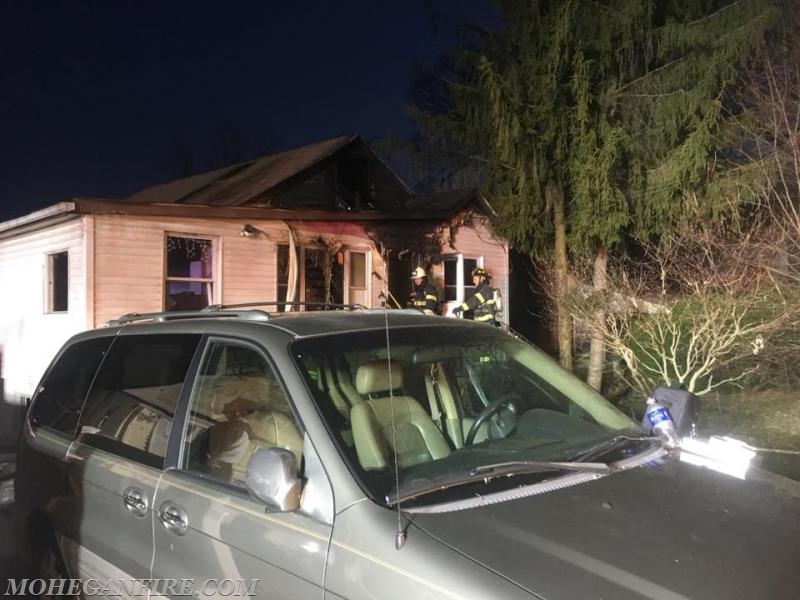 Prior to this fire, members handled a heavily involved vehicle fire at St. Elizabeth Ann Seton Church on East Main St in Shrub Oak in the morning and a 75 foot diameter brush fire in the rear of a residence on Alpine Dr in Cortlandt during the afternoon. This fire was the fourth structural fire in our district within 9 days.